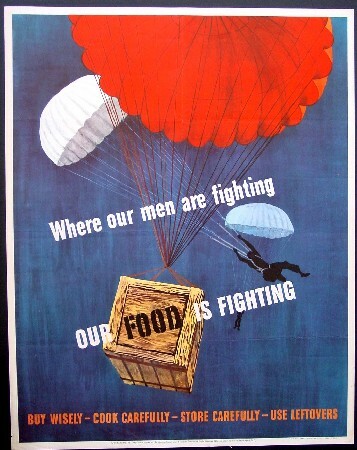 Comments: Nice colors, important message, effective presentation in this poster showing both a soldier and food parachuting onto the battle field. On the bottom is the message, "Buy Wisely--Cook Carefully--Store Carefully--Use Leftovers." Condition: Very good, unbacked, very small chip out of left bottom corner (barely visible in picture to left) otherwise no tears or paper loss.